The truth is this: A salesman will aim to control the situation, pushing you into cars he wants you to buy at his price. Don't let him. Before you even set foot near a showroom, decide which car you want, how much it should cost (with What Car? 's Target Price discounts), how cheap you can get finance and how much your car is worth if you're trading it in. If you're vague on any of these details, you'll be an easy target. They certainly can, unless you're buying something truly exotic or in high demand. 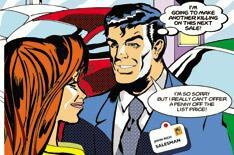 Take a look at our Target Prices here on whatcar.com to find out the most you should pay. Once you're armed with this information, you can wave it under the salesman's nose. See if he'll match it or better it. If he won't, there should be plenty of other dealers who will. Wrong again. You can expect the same discount on factory-fit extras as on the basic list price of the car. Yes, there are. Virtually every finance deal is underwritten by the manufacturer. Dealerships' margins are fully intact, so you can still haggle for money off the car and for a lower finance rate. Special editions enjoy the same discounts and are worth no more than the model they're based on at resale time. Some are good value, though, with more equipment for a lower list price. No thanks - why would you put money down on a deal that hasn't been worked out? Get a price you're happy with first.